Delivers everything the job demands. And then some. Best-in-class payload. Best-in-class cargo volume. There’s no denying it. These vans are made to carry the load. Available in 3 GVWRs, 3 roof heights, and 3 lengths, the Sprinter Cargo Van offers the right solution no matter what the job demands. Offer ends February 28th, 2017. © 2017 Mercedes-Benz Canada Inc. 2016 Sprinter 2500 144” Cargo Van shown, total price $42,770. *Total purchase price of $42,770 includes MSRP of $41,900, all applicable dealer fees (freight/PDI up to $2,995, dealer admin fee up to $500, tire duty $15, air-conditioning tax $100 and PPSA up to $56.49). Lease offers based on the 2016 Sprinter 2500 144” Cargo Van available only through Mercedes-Benz Financial Services (MBFS) on approved credit for a limited time. **Lease example based on $445 per month for a 60 month term, a lease APR of 2.99%, with a down payment of $0 (excluding dealer fees). First month’s payment plus a security deposit of $550 are due at signing. Total obligation is $47,457.49 which includes an end of lease residual value of $16,341. Licence, insurance, registration and taxes are extra. Dealer may sell for less. 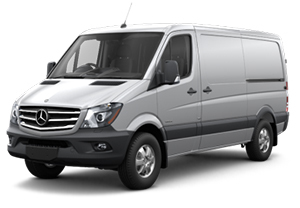 2$3,000 discount is only available for 2016 Sprinter Cargo Vans. Up to $5,000 cash incentive only applicable with a valid membership at Building Supply Industry Association of BC/Mechanical Contractors Association of BC/Canadian Construction Association/Canadian Home Builder Association. Total obligation is $59,085.30 which includes an end of lease residual value of $20,241. Dealer may sell for less. Manufacturer order may be required depending on dealer inventory at the time of purchase. 3Offer valid only on approved credit from Mercedes-Benz Financial Services (MBFS). Offers are non-transferable, non-refundable and have no cash value. Offers may change without notice and cannot be combined with any other offers. Certain limitations apply. See Mercedes-Benz Surrey for details or call (604) 581-7662. Offers end February 28, 2017.